Manufacturer of a wide range of products which include motorized pad printing machine, pad printing machine, logo printing machine, close cup motorized pad printing machine, automatic pad printing machine and electric pad printing machine. We are offering Motorized Pad Printing Machine to our clients. 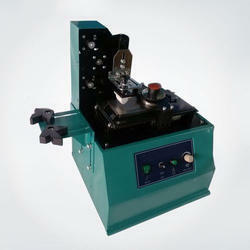 We offer Pad Printing Machine. LOGOs, manufacturing date, ingredients, bar code, issues, etc. on industrial products of food, cans, beverage, cosmetics, electric apparatus, pharmacy, etc. It can print on any flat, curved or uneven surface on metal, plastics, glass, ceramic, nylon etc. at speed upto 2000 strokes per hour. It uses a flat metal etched plate which carries the image, thick liquid paste ink which is cleared with a closed cup scraper & a soft silicon rubber pad which picks up the image from the plate & transfers it on to the substrate. (Free accessories include small Silicon Pad & Metal Plate). This coder is suitable for printing LOGOs & fixed information on small jars, glass, foil, tins, bottles (curvature), etc. Multiple machines can be used for multiple colors. We are offering Logo Printing Machine to our clients. We are offering Close Cup Motorized Pad Printing Machine to our clients. We are offering Automatic Pad Printing Machine to our clients. This coder is suitable for printing LOGOs & fixed information on small jars, glass, foil, tins, bottles (curvature), etc. Multiple machines can be used for multiple colors. Closed Cup Motorized Pad Printing Machine Model TDY - 380 is an automated replacement for Screen Printing & is used for very high quality printing of size up to 21/2" X 21/2" for LOGOs, manufacturing date, ingredients, bar code, issues, etc.